Kye Kim’s expert techniques and long years of cooking experience brings this book which emphasizes health and modern twist on Asian flavors. 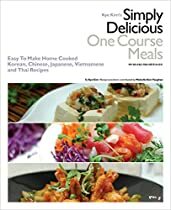 This collection of recipes ranges from the classic (Kimchi Pancakes), to comforting (Sizzling Rice Soup), to fresh (Simple Asian Slaw with Black Sesame Rice), to deeply satisfying (One-Pot Seafood and Vegetable Rice). It features recipes for sauces, tips for substitutions and helpful hints, all aimed at helping you turn these one course meals into a new lifestyle with a focus on taking care of yourself and those you love. With special Korean food recipes that are elegant, easy, and just simply delicious, this book is a guide to the pleasures of sitting down to a home-cooked meal every night of the week, even with the stresses of a busy schedule and a full-time job.